S&P’s warning on the US credit rating and the subsequent refusal to acknowledge the problem should give investors pause. The inability to tackle the budget deficit and debt problem is causing the Dollar to selloff and head towards levels not seen since late 2009. The US government continues to follow the thesis posited in my 2011 commentary. Instead of cutting spending, both parties in Congress are fighting to see how little they can cut. As the debt ceiling deadline approaches, Republicans are being backed into a corner with media outlets calling for doom if the debt ceiling is not lifted and constituents screaming for spending cuts. Personally, I felt the liquidity needed to propel our economy forward was sufficient even before the FOMC opted last November to buy $600 billion in additional Treasuries on top of the committee’s pledge to replace the runoff of our $1.25 trillion mortgage-backed securities portfolio. I argued as much at the FOMC table. I considered the risk of deflation and of a double-dip recession to have receded into the rearview mirror. Some fear that the strong rise in commodity and energy prices will lead to a more general sustained inflation. Yet, at the end of the day, such price shocks don’t create sustained inflation, monetary policy does. If we look back to the lessons of the 1970s, we see that it is not the price of oil that caused the Great Inflation, but a monetary policy stance that was too accommodative. In an attempt to cushion the economy from the effects of higher oil prices, accommodative policy allowed the large increase in oil prices to be passed along in the form of general increases in prices, or greater inflation. As people and firms lost confidence that the central bank would keep inflation low, they began to expect higher inflation and those expectations influenced their decisions, making it that much harder to reverse the rise. Thus, it was accommodative monetary policy in response to high oil prices that caused the rise in general inflation, not the high oil prices per se. As much as we may wish it to be so, easing monetary policy cannot eliminate the real adjustments that businesses and households must make in the face of rising oil or commodity prices. These are lessons that we cannot forget. Yet when it came time they voted to continue the same policies they spoke out against exposing them as doves rather than hawks. In contrast, Thomas Hoenig who spoke out against accommodative monetary policy not just in speeches but in FOMC statements as well. We have the Democrats spending like drunken sailors, the Republicans paying lip service to the reason they were elected to Congress, and a Federal Reserve that cannot define how inflation is created. At this time one should be reducing the leverage in their portfolios until the investment landscape becomes clear. The market this year has had some rough times. 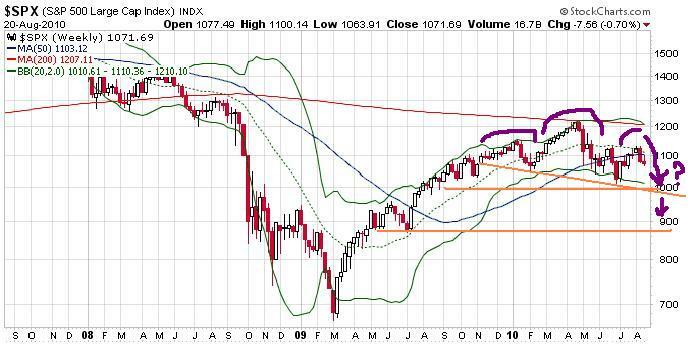 The rally which started in March of 2009 topped out in April of 2010 and caused the market to trend lower for the last 5 months. But as mentioned in my last article the market is approaching a moment in time when a solid buying opportunity will emerge. On the bearish side of the equation we have weak economic growth, stubbornly high unemployment, massive budget deficits, and a weak banking sector. There is also the issue with the Hindenburg Omen, for which a downside move of just a few more percent would make the signal a success. On the bullish side we have an equities market that seems overvalued from a PE perspective is undervalued based on dividend yield when compared with similar yields on US Treasuries, AAII surveys showing that small investors are bearish, and favorable profit growth in the large cap sector. The stock market has in many way mirrored the returns of the market in the 70’s where we had whipsawing action sideways for many years until inflation was dealt with by Paul Volker and set the stage for the great bull market in equities that ran until 2000. Intel’s announcement guiding revenues and gross margins lower in the third quarter may be the harbinger of earnings warnings in the tech sector as companies move to get the bad news out early. September is a month where earnings and economic worries are likely to provide some stormy weather for the markets but once we move into the fourth quarter the skies should clear for a nice rally into 2011 although we are likely to end the year on the downside. As mentioned before, there are a number of high quality blue chip stocks with attractive dividend yields that can provided comfort to investors with a steady income stream. Once the weather clears these stocks should lead the market higher as investors look to dividends for safety in these turbulent times. I would like to start by making a comment on my last article. Globally, there are values in financial stocks in countries not hit as hard as the US and Europe. My bearish stance is US based, not global. If one takes the time to look they can find good values, especially in Asia and Canada where banks are lending and making solid profits. Recent home sales numbers were positive. Inventories are being cleared from the system; which given the new wave of resets is a very good sign. There is a question of what will happen in 2010 when the tax credits expire. I have a pretty good idea on how this plays out in the coming year but would like to see more data before my thesis gets solidified. In the meantime, if sales and inventories continue to fall, properties in the grey market will likely come online. The faster this glut of grey market properties work their way through the system the quicker we can return to normal. The scenario is similar to how tech companies had to wait for equipment purchased by dot.coms who went bust to work their way through the system in 2001 and 2002 before they started to see any growth. The recent pullback in gold and silver is a pause that refreshes. Gold seems to be tracking the dollar which is headed for a retest of the lows made in 2008 which retested lows made in the 1980’s. 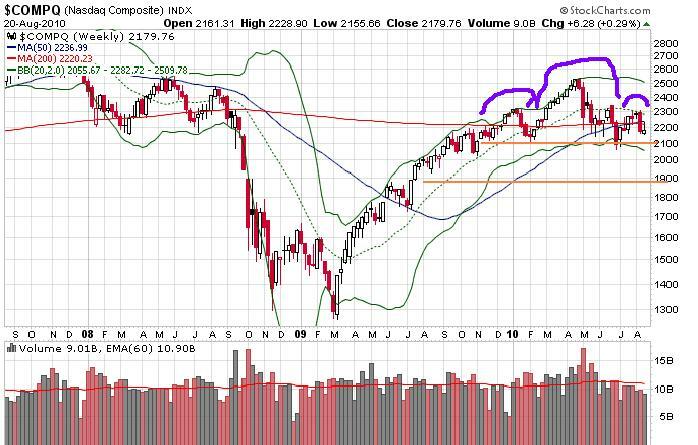 The key is what happens next year during the period of time when we retest. Do we dare look back to what happened more than 25 years ago? I have a pretty good idea how this scenario plays out through 2010 but once again need to see more data before my thesis become solidified. Neutral to bearish in hard commodities. There are some seasonal factors at play here and the technical charts do not look strong at all. An upside breakout would turn me into a bull but I believe each metal, with the exception of gold and silver, needs to take a break and reassess its fundamentals vis-a-vis stockpiles and supply-demand fundamentals. Agriculture stocks continue to provided fantastic value and returns if you are willing to do your homework. Sugar should underperform relative to other soft commodities. The broader market is likely headed higher after a correction but there are better returns elsewhere outside the major indexes. 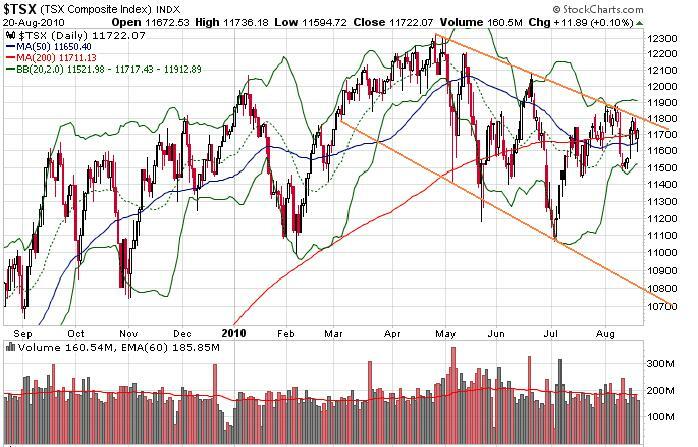 The next group has yet to emerge and assume leadership in the market so what we are seeing is not the beginning of a bull market but rather a correction in a long-term (decadinal) sideways movement. The Fed statement spoke about extending the mortgage securities purchase program into the first quarter of next year. This is an admission that they will not be able to wind down this program as fast as programs like TALF. Rates will end up staying low in the Unites States much longer than people expect. I believe that those looking for a rate hike in 2010 will be disappointed. Not going to chase the market for a number of reasons, but most of all we should see a retest of the March lows sometime in the distant future, maybe a year or so. The US banking sector is still not healthy and has been propped up by regulatory rule changes. So while financial stocks may be doing well at the present time they will not be the leaders in the new cycle for a variety of reasons. Among them are the mark-to-market rules, increasing non-performing loans, and difficulty in earning a solid NIM in a 0% cost of funds environment. In order for a new bull market to begin, a new sector must take up the leadership mantle. The leaders from the previous cycle do not lead in the new cycle. Technology is unlikely to provide leadership as R&D budgets continue to get cut. Businesses are unlikely to commit to major capital spending programs, despite a 0% interest rate environment, amidst falling revenues and uncertain consumer demand. Consumer uncertainty about the future will translate to a cautious business environment going forward. It may sound strange to say this but with top line revenue growth falling and earnings estimates being met by cutting employees and R&D budgets, this is not a healthy sign for the future. Without top line revenue growth earnings momentum will be difficult to maintain. You can only cut so much staff and R&D. At some point revenues need to grow and that will only come through increased consumer confidence. When you combine an US unemployment rate that has gone from 5% to 9% and 70% of US GDP being made up of personal consumption, it is no surprise that consumer demand is weak and consumers are tightening their budgets. We will need to see strong hiring in order to get consumers feeling better about the future and opening their pocketbooks. I am not a proponent of massive budget deficits but right now government spending is propping the US economy from falling off a cliff. This happens in every recession so there should be no surprise here. Government spending is adding a couple of percent to GDP at the current time. A significant portion of the stimulus money is targeted to be spent in the coming years which should help the recovery. The question is how much will it affect hiring which should translate into higher tax collection as well and possibly allowing the government to meet their optimistic projections for the 2011-2012 time frame, although it is not the authors opinion that the overly optimistic projections will not be met. The biggest question concerning the recovery should come from the balance sheet of the Federal Reserve. It is Mr. Bernanke’s intention to begin shrinking the balance sheet of the Federal Reserve in the coming years bringing it back down to a reasonable level. The largest problem is how much will the shrinking balance sheet constrain the economic recovery. In order for the Federal Reserve to sell the securities it now holds there needs to be a buyer on the other side of the transaction. It is unlikely that the capital will come from drastically higher leverage levels at hedge funds and banks. This means the capital needs to come from either foreign governments or the private sector. Capital coming from the private sector will mean less capital for investment purposes. Capital coming from foreign governments means competition for Treasury sales. Any recovery will be slow and grinding which is not what the bull camp wants to hear. So what am I doing right now? Sitting on the agriculture purchases I have made over the last six months. Farmland, fruit, vegetable, and sugar production has provided a nice hedge and decent returns. There is tremendous value in the sector with some stocks already surpassing pre-crash highs. Gold and silver should begin moving to the upside in the next few months but I am content to wait for a washout correction. This should occur about the time we get either a peak in the US Dollar, the US equity market, or both. We have yet to see a 50% retracement from last years lows which is giving me pause, although there are some interesting trades in the large cap sector. I am back temporarily to expound a bit on what is going on. Do not get excited but I feel the need to cut through the noise once again and give a bit of clarity.